The continued government shutdown has affected far more than the estimated 800,000 government employees waiting to go back to work. Hiring managers, even those who work in the private sector, are having to grapple with the absence of E-Verify services during the shutdown. The E-Verify website, which compares information from an employee’s Form I-9 to the U.S. Department of Homeland Security (DHS) and Social Security Administration (SSA) records to confirm authorization to work in the United States, has been down since the start of the government shutdown on December 22. Due to the length of the shutdown, many experts warn that even when the site is operational again, there will be a considerable backlog of cases, resulting in slower service. While employers are generally expected to create an E-Verify case by the third day of an employee’s tenure, this rule is suspended for cases affected by the shutdown. When an employee’s information presents a tentative nonconfirmation (TNC) in E-Verify, they generally have eight federal government working days to begin resolving it, either by visiting a SSA field office or calling DHS. However, due to a backlog of files once service resumes, there will be an extension on the amount of time that employees can begin the process of resolving TNCs. Additional guidance will be available once operations resume. In the meantime, employers should keep track of all new hires for whom E-Verify queries were unavailable due to the shutdown. Once operations resume, employers should also be sure to attach a memo in the employee’s E-Verify file indicating that the employee was hired during the shutdown. See SHRM’s article for more information about about what employers and HR managers should do during the E-Verify outage. On January 9, the 4th U.S. Circuit Court of Appeals sided with an employer, Schneider Electric, in a discrimination case brought by an employee. According to the plaintiff, she was passed over for a promotion due to discrimination on the part of her employer. She supported her case with a recent positive performance review. However, Schneider Electric claimed that she hadn’t been promoted due to poor communication skills. To support their claim, they pointed to written documentation of conversations between the plaintiff and two former supervisors, as well as a performance improvement plan meant to help the plaintiff sharpen her skills in order to qualify for a promotion in the future. While this case hasn’t been published (and therefore won’t be able to serve as legal precedent), it does illustrate an important point for employers: documentation is crucial. By having regular documented conversations with employees about their performance, managers can help protect the company from future liability from employees who feel their dismissal (or lack of promotion) are the result of discrimination or other ill intent. Read more about this court case here. In a recent XPertHR survey of 800 HR professionals, 64% of respondents described sourcing quality applicants as “very or extremely challenging.” This is in keeping with what many experts predict will be an ongoing problem in 2019, with unemployment hovering at near-record lows. In a candidate-driven market, employers face an uphill battle to attract the best applicants. Predictably, competitive pay remains the most important factor for job seekers. But employers can also help their recruiting efforts (and improve retention for current employees) by offering paid parental leave, flexible work schedules, plenty of professional development opportunities, wellness initiatives, and other perks that demonstrate commitment to employees’ personal wellbeing. According to a recent Accountemps survey of 2,800 senior managers, 94% indicated that they’d be willing to rehire former employees who left on good terms. However, of the 1,000 workers polled, only 52% would consider applying for a job at a company they’d left. For the 48% who said they wouldn’t, reasons cited included dissatisfaction with leadership, poor culture fit, and unfulfilling work duties. These findings highlight the importance of exit interviews to help employers understand what makes employees leave the company and make adjustments accordingly. While re-hiring former employees may seem like a straightforward enough affair, hiring managers should be careful to ensure that the company is able to adequately address the underlying reasons for the initial departure. Once a former employee has accepted a job at the company, managers should also be sure to take the time to re-orient the new hire so that they’re up to speed on any new procedures or policies that have been implemented since they left. That’s it for this month’s HR Roundup. 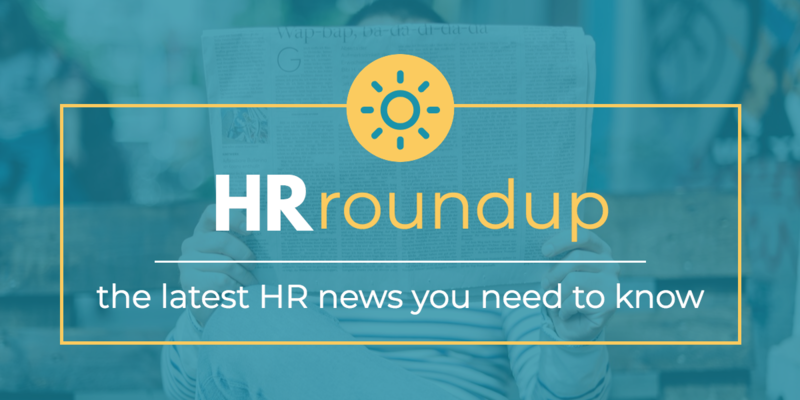 To stay up to speed on what’s happening in the world of HR, subscribe to our blog below.